Alexander's foreign policy was characterized by antagonism with Napoleon I and Russian expansion: by 1815, Finland, almost the entire Transcaucasia, the Kingdom of Poland and Bessarabia fell to Russia. Russia took part in the European War of Liberation2 against France until the deposition of Napoleon I in 1814. Many believers saw "The White Angel" in Tsar Alexander, as they saw "The Black Angel" or the incarnated Antichrist in Napoleon. 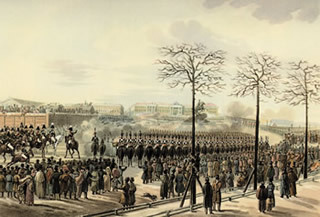 With Alexander's victory over Napoleon, the Tsar had reached the highest level, the idolization by his fellow countrymen, the worship of all peoples of Europe however, he nevertheless suffered heavily under the inhuman burden of responsibility to be considered the "Saviour of Germany and of Europe", which meant that he was seeking salvation outside his Church. In this "epic" Alexander ascribed to himself the role of a tool in the hands of providence. 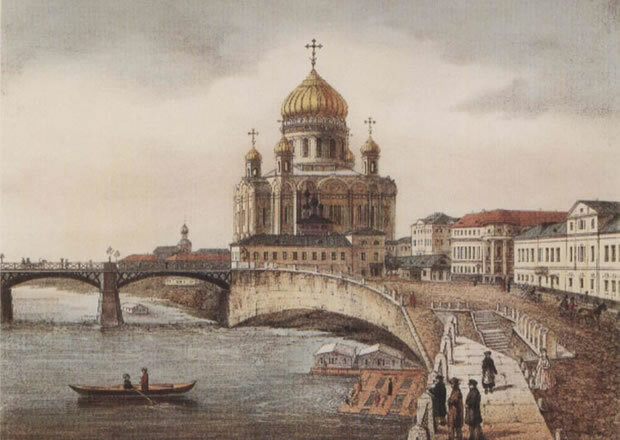 Alexander planned the construction of the main monument: the Cathedral of Christ the Saviour in Moscow as a memorial to the victims, the Russian people "to signify Our gratitude to Divine Providence for saving Russia from the doom that overshadowed her." The war of 1812 and the victory of Russia over Napoleon (1814) had resulted in Russia, as in Europe, the reawakening of religiosity. Since 1812, in addition to the Bible, Alexander's daily reading included the works of the pietist3 Heinrich Jung-Stilling from which some had been translated into the Russian language. Jung-Stilling was a spiritual authority for Alexander and his voice held great weight for him, so that the Tsar expressed the desire to get to know him personally, which was realized in 1814 in the Bruchsal castle in Baden during a visit of the Tsar with his parents-in-law. On the way to his headquarters in Heidelberg Tsar Alexander I met the mystic4 Baroness Juliane von Krüdener, for the first time in Heilbronn on June 4, 1815, with whom had a three-hour interview. In the following months Mrs. von Krüdener became one of the closest confidants of the Tsar. As "Europe's Savior" and under the influence of Juliane von Krüdener, Alexander I, in 1815, determined, in the Congress in Vienna, in a decisive way, the new order of the continent and the Holy Alliance5, which carried the handwriting on the monarchic principle. 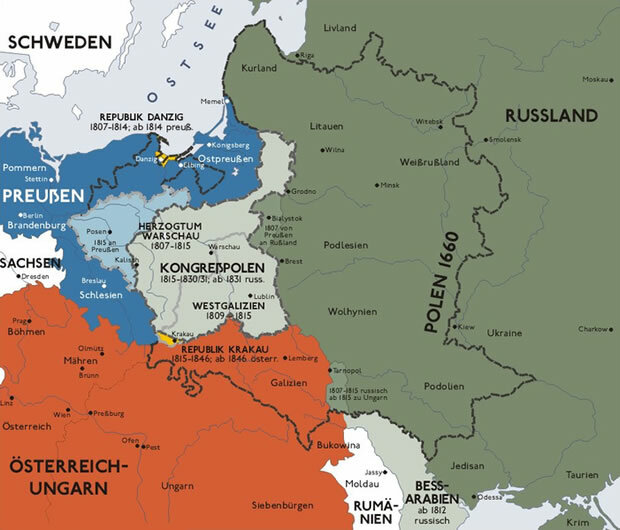 Russia received large areas of Poland at the expense of Prussia and Austria through the creation of a Polish Kingdom in personal Union with the Russian Empire, called "Congress Poland". Alexander I was considered by his contemporaries as a deeply-religious Christian, savior of the time and the Russian Empire as a recovery place for many believers in the end time, the time before the last judgment, as for example for the Swabian Chiliasts6. The Tsar, during his last years of reign, obviously fell more and more into melancholy and paranoia, which drained him also physically. Once the Tsar, who had his eyes on liberal and reformist ideas, changed after the defeat of the French Emperor into a tyrant pervaded by a sense of mission and pietism. 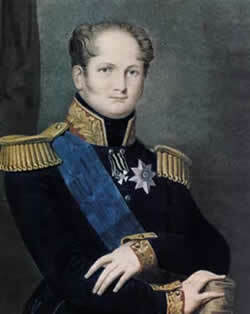 Alexander who had an increasing fear of a revolution established a reactionary police regime, since 1815, whose crisis of Decembrist7 revolt was revealed after his death. He died on December 1, 1825 while traveling on the Crimean peninsula. 2 As Wars of Liberation or Wars of Freedom are summarized as all historical military campaigns which occurred between the troops of Napoleonic France and its opponents (Great Britain, Russia, Prussia, Sweden, Austria and a number of German States, including the Kingdom of Württemberg) between 1813 and 1815. 3 Pietist = Representative of Pietism, a Protestant movement of the 17th and 18th Centuries which tried to overcome the orthodoxy by deeper piety and active charity. 4 Mysticism = (Greek: mystikós "mysterious") In the history of religion a basic form of religious life which tries to lift by pondering the separation between the human and the divine being in the experience of realization of God from experience (Cognitio Dei experimentalis) or the Union (Unio mysticism) and is considered mostly as the highest level of piety. Asceticism (Strictly moderate and renouncing a way of life for the realization of moral and religious ideals) and contemplation (meditative thinking about the religious truth) serves in preparation of this aim. In their expressions by the mystics it can be emotional, sensual, and ecstatic, or intellectual and speculative. Important developments of mysticism are found in China in Taoism, in India the doctrine of salvation of the Vedanta (Shankara), in Japan in Zen Buddhism, in ancient Greece in the mystery cults, in late antiquity in the Neoplatonism, in Judaism in Hasidism and the Kabbalah as well as in Islam in Sufism. In Christianity, mysticism appears already in the New Testament with Paul and John as Christian mystics whose aims are the immediate unity with Jesus Christ; since the Middle Ages it occurred often in the form of passion mysticism, as compassion with Jesus. 5 Holy Alliance = At the instigation of Tsar Alexander I between Russia, Austria and Prussia and signed in Paris on September 26, 1815, as a guide to the States according to the principles of Christianity, of Justice, of love and of peace, and to afford each other assistance. All European rulers with exception of Great Britain, the Holy Chair and the Ottoman Empire joined the Holy Alliance. To the latter, because of the Christian adjustment, the accession of the Alliance was denied. Originally, the Holy Alliance should rearrange the relationships between European States after the Congress of Vienna on the basis of Christian principles. In fact, the Alliance aimed at a restoration of the political circumstances of the time before the French Revolution. However the Holy Alliance didn't gain a greater political importance and broke up after a few years due to differences between the European powers about the Greek war of independence (1821-1829). 6 Chiliast = Supporters of chiliasm or millenarianism; from the Greek chilias: 1000; denotes the belief in the Second Coming of Jesus Christ and his millennial reign on earth at the end of world history or at the end of all evil, in which only the fair should participate. It is based on the place of the Apocalypse of John (Ap 1:1; 20:1-8). The term is also used as an indication for the belief in the near end of the current world, sometimes connected with the creation of an earthly paradise or an apocalyptic fatalism in connection with a new millennium. Traces of Chiliasm can even be found in the first centuries of Christianity. Until the Middle Ages, people feared, therefore, that the transition from one millennium to another sealed with the rebirth of Christ, the end of the world itself. Most Protestant Reformers rejected the Chiliast principle, but in the 16th Century it was revived again with the Anabaptists and Taborites. In the 17th Century Protestant revival movements were attached to Chiliasm. From there it found its way into Pietism. Today for example the Adventists, Mormons and Jehovah's Witnesses believe in a Millennium. 6 Decembrists were "noble revolutionaries", who after the death of Alexander refused to swear allegiance to the new Tsar Nicholas I.. Five of the conspirators were executed and more than a hundred were banished to Siberia. Since the revolt in December (Russian: Dekabr') had taken place, their protagonists were called Decembrists.